Spend a few minutes with James Shaffer and you’ll quickly discover that he has a fervent passion for pedestrian interactions and public spaces. His company, the Denver-based Streetscapes, Inc., supplies distinctive furniture and site amenities, but his love for people and places is rooted in his Berkeley, California, upbringing—a university locale infused with abundant public vibrancy and activity. I sat down with James recently at a local Denver coffee house to discuss the future of streetscape activation and vibrancy. 1. You often say that public spaces are about the people. What are the implications of this view in terms of how cities approach streetscape design and pedestrian communities? People really want to be where other people are. It is a normal part of human nature to people-watch, get involved in activities and engage in interesting experiences. Therefore it is incumbent upon cities and communities to activate public spots where people feel comfortable in interacting with others. There should be places for people to stand, sit, and move about so they can enjoy activities that capture their interests. 2. How are cities addressing this need for engagement? Quite honestly there are a lot of public space managers and property owners who believe that if they install a bench for people to sit on, community vibrancy will magically appear. That is simply not the case. You have to give people a more compelling reason to use the space. A key consideration here is the functionality of the furniture and site amenities placed in the area. In other words are these elements effectively integrated with coffee houses, retail centers and other nodes that support pedestrian activity? Also attention should be given to the diverse set of people that may use the space, whether that means individuals, families, kids, couples, seniors—even our beloved pets. 3. So you’ve probably become quite good at eyeballing a public space and determining whether it’s functional for public use? [Laughter] Sure. In fact, some of this is very intuitive. For example, should an outdoor bench be positioned in the sun or the shade? If it is placed directly in the sun on a humid, 90-degree day, people may be less likely to sit there. The size of the seating may also be a factor. Can the seating arrangement expand or contract to accommodate the size of a group? That is why portable chairs are a good option in many settings— they allow people to move them around to create a more amenable setting. 4. Historic preservation is a hot trend these days. How are cities making effective use of site amenities to highlight the local character and culture of an area? Many communities these days are looking for something unique to make their area stand out. Unfortunately the cookie-cutter approach still prevails, with little creative thought given for how a community can distinguish itself from its neighbors. Fortunately cities are slowly recognizing the importance of site amenities like outdoor furniture, street lighting and directional signage in activating tourism and other forms of economic development. Some are even taking thoughtful steps toward incorporating icons of cultural significance into their streetscape design. When effectively meshed, these elements can enhance the style and features critical to effective community branding. 5. So it appears that communities are waking up to the realization that street activation is critical to their economic development efforts? Yes, I am definitely seeing some encouraging signs. 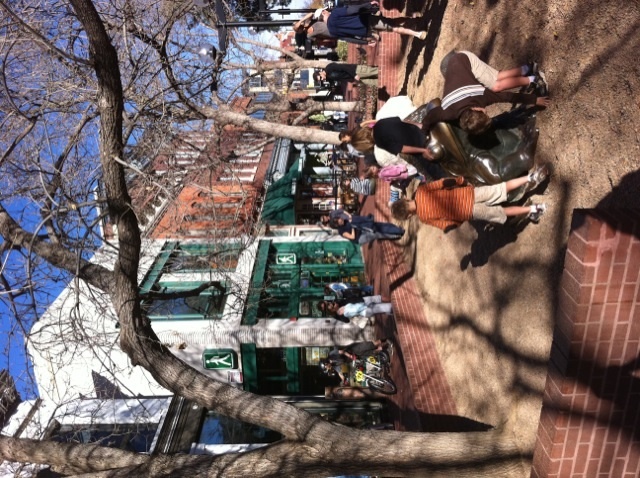 Street activation ultimately comes down to cities finding the right public settings to capitalize on—engaging what I affectionately refer to the “supporting characters.” These include coffee shops, post offices, libraries, parks, municipal buildings and other community assets that generate pedestrian foot traffic. Feeding off these nodes of activity is critical to stimulating economic growth in an area. While it could be argued that places like post offices are a dying breed, they still serve as a focal point of activity in many communities. Sadly, many post office locations are being moved from core neighborhoods to strip mall locations. Moves like these can have an adverse impact on the local urban fabric and community building. 6. Talk to us a bit about the growth in alternative forms of pedestrianism like bicycling and, in particular, bicycle storage issues. I’m seeing bikes chained to trees, railings and other stationary posts due to a lack of parking space. What’s up with that? There is no doubt that bicycling is growing in popularity. And some cities are unprepared for this emerging trend. Many of the problems associated with storage stem from the wrong type of bike rack. The serpentine racks that are popping up in many cities have horrible functionality. They’re not wide enough to accommodate multiple bikes. Cities that use loop racks or dividers are faring much better because these create a more orderly and straight mechanism for parking. However, I’m optimistic about all of the innovations taking shape in terms managing the bicycle craze. For example, growing numbers of cities are embracing solutions like dedicated bike locker and parking stations. In some cases cyclists can use their cell phone to reserve secure spaces complete with an access code. And automated bike storage retrieval systems are on the horizon, which will foster better space management. This bodes well for cyclists in terms of convenience and for cities in the more efficient use of public space. 7. Speaking of forms of mobility, there has been a lot of discussion lately about the future of buses, light-rail and other transit systems. How does public transportation sync with streetscape and site amenity opportunities? One of the tools missing from most transportation-oriented developments (TODs) is good directional signage. In many cities, signage for public transportation is nonexistent or poorly situated. And there is little recognition of how important signage is in terms of steering people to and within neighborhood stops. When I visit various public locales, I am constantly amazed by the lack of directional materials. This is a dissuading situation for a city trying to fuel tourism and economic development. 8. During this economic downturn, abandoned storefronts and blight have become a common reality in many business districts. What site amenity solutions do you suggest for generating economic activity? First, engage local business owners to explore collaborative opportunities for addressing these issues. For example, in storefront windows there are low or no cost display products that can be used to dress up a retail environment a bit; to give the impression that the affected area is still active and alive. Providing incentives for nonprofits to use abandoned or underutilized spaces is another option that is gaining traction as a traffic generator. Communities can also use creative opportunities like pop-up events and restaurants to attract people to dead public spaces. In a park, you may want to encourage exercise classes. Or story time for kids in a local library. Anything that helps fuel activity can serve as a catalyst for long-term business attraction. 9. Are there monies available to support public space design and site amenities in struggling communities? Yes. Particularly if there is a tie-in to transportation-oriented efforts. Federal agencies have been very active in this effort through HUD Livability Grants and CBG funding. Cities and states also have some resources, although these have been somewhat limited by the economic slowdown. Monies often are also available through local and national foundations. 10. What are you seeing in terms of the future of functional streetscapes as a catalyst for economic and pedestrian activity? 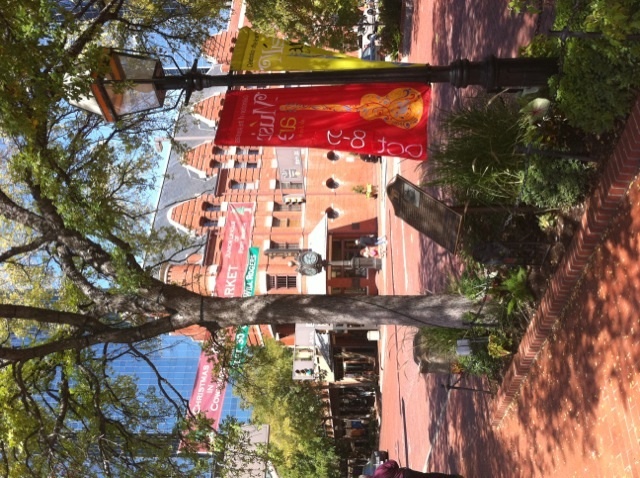 There are tremendous opportunities for cities that are effective at branding and promoting their public spaces. Cities need to create vibrant streetscapes that generate a “Wow!” factor and encourage pedestrians to hang out and enjoy the amenities. It’s all about public spaces with compelling things to do that are worth checking out. Giving people a good reason to return often is what its all about.